Veganishta Creations: Is it a smoothie or a juice drink? Is it a smoothie or a juice drink? Yesterday I decided to take in yet some more greens and fruits. I pulled out the juicer and the blender and scrounged the fridge in the garage and the one in the kitchen. 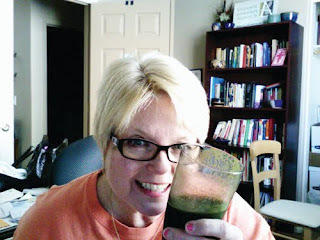 I pulled out carrots, celery, blueberries, banana, apples, ginger root, and frozen spinach. I wanted to use fresh spinach but with a sore foot and walking on a cane, I decided not to attempt the 45-minute drive to Whole Foods. This juicing/blending event turned into quite the mess, but the end result was worth it. First I juiced the carrots, celery, apples, and ginger root, then I poured all that into the blender. Next I added the blueberries and frozen spinach and banana. My blender is not the best (have to get a Vita Mix) and so it kept jamming, and I had to keep moving things around with a wooden spoon. Finally, I gave in and added one cup of water and that paved the way for a smooth blend. I made enough to fill one tall glass and also filled a large Bolthouse Farms drink bottle. I had another glass of the juice or smoothie stuff today and looks like I'll have enough for tomorrow and possibly the next day. I'll go with the fresh greens next time, but still, I'm sure my body is thanking me for this gift of antioxidants and other nutrients it is receiving from this blended concoction. I have noticed a HUGE change in my skin since becoming near-Vegan the last four months. I previously had horribly dry skin, and my hands looked like a 95-year-old woman's hands. Not anymore. I don't even use hand lotion as much. My skin is more moist and shiny and smooth. I'm sure the olive oil and all the greens had something to do with that, not to mention giving up the dairy and meat!